Creating programs that build new jobs for college students. 575 College will create programs that build new jobs for college students. Image: Example of college students changing the world. UCLA Dance Marathon 2011 raised $410,530 for medical research. Create new jobs and work experience for college students. Generate new sales for partner companies. Develop innovative methods for companies to target new markets and small business customers. Provide an incredible positive PR message for partner companies by actively involving and training college students. Produce a sustainable element to the program so that funds generated from the program will allow the program to expand to new campuses and provide training for more students. 575 College is different from most other companies entered in this Vator Splash competition. We are building a proprietary platform that in the initial phases focuses exclusively on working with students. Our unique product came from experiences derived from our founder working actively with students and campus groups over the last 7 years. We launched the company by using and enhancing existing technology tools that are proven to scale. This approach allows us to focus on developing relationships with students and building programs that will provide great working experience and projects for students introducing them to entrepreneurship. Our target audience is college students that need work experience and skills training to make them more valuable when they enter the job market. In the initial phases, we will use events and our current online traffic to generate relationships with new students. We can use event photos as a simple way to develop users. 575 Productions has provided event photography services in Southern California for 7 years at over 3,000 events. The event photos create a good amount of site visits and traffic. For example, in September of 2010, we took pictures at 3 UCLA group events. The groups had a combined total of 350 people at the events. The photos from these events on our website generated 18,000 unique visits, 11 page views per visit, and an average time per visit of 4 Minutes and 45 Seconds. The total time on the site was around 85,000 minutes or 1,425 hours. This is a huge amount of traffic for a small number of students at the events. We will use the event photo model to spread to new campuses and generate website traffic from new students. Our main focus is providing valuable projects and work experience for college students. The technology we develop will be dictated by the needs of the students. We want the students to come out from behind their computer screens or phones and become actively involved in exciting projects, training, and networking events. We are not building a new job board. We do not want to be a recruiting company. We want to develop an entirely new experience for how college students prepare themselves to enter the job market. We are training students and building teams to promote, market, and implement technology products. This training and labor force creates a valuable service that can be used to benefit many products or industries. We are currently building two paid programs with Revolucion World Wide and LDNetwork.org. The Revolucion program is built around their ABC Weight Loss System. The program will build a virtual nutrition education and health support network for members of WomenInTrucking.org that are participants using the ABC Weight Loss system. Students that are studying nutrition or exercise science will serve as virtual coaches for the participants. The students will create weekly nutition plans and communicate actively with participants to provide support and help ensure retention on the product. This program involve 4 students at each campus beginning with UCLA, Santa Clara, and University of Oregon. The LD Network is non-profit that aims to build a network of families, students, schools, and professionals to create a free online resource to help students with learning disabilities identify schools and services that best cater to their individual needs. The 575 College program for LD Network will recruit students from local colleges that are involved in special education programs or pursuing a career in education. The 575 program will create valuable work experience that will correlate to their future career. This program will involve 2 students at each campus beginning with UCLA, Santa Monica City College, and Cal State Northridge. Create new job programs for college students. Teach students small business and entrepreneurial principles. Provide projects to test and grow their skills. Build a nationwide labor force for larger projects. Launch new initiatives for 575 College and partner companies. Student Opportunity - Receive a variety of work experiences across different disciplines that will build skills and teach core business principles. Students gain valuable work experience, develop relationships with companies, work within teams, and apply technology to projects. New jobs will be developed through programs within 575 College. Internal Programs: Built around products and services that 575 Productions has used through the existing business and relationships in Los Angeles. Examples - event photography, photo booth, video production, and website development. Event Photography: Students are trained as photographers to take photos at campus events. Students are also trained in sales/marketing to book new events. Event photography generates revenue through service fees for the event and advertising sold to local businesses near the campus. The event photos create traffic and users on our website. Local Advertising: Students will be trained to sell advertising packages to local companies around the campus. The ads will be displayed around the event photos on our website. The ad packages can include banner ads, business profile page, job board listing, video, or daily deal/coupon. The advertisers would be similar companies that purchase advertising in the local campus newspaper. Job Board: 575 College will have a job board to market internal job and project opportunities. We will also post job listings from local businesses. Students will be trained to sell job listings to local or national companies that want to target the college market. Students can also offer other services to the business like photography or website development. The jobs can also be posted on banners within the event photo portal. Daily Deals: 575 College will have a daily deal portal for companies to target highly relevant deals to local students. Our goal is to use students to work with the company to create a deal that is very relevant to the student population at the campus. The deals will not be spa treatments, fitness classes, massages, or pet photography. We want to offer deals that are highly relevant to the students with items they purchase on a regular basis: sandwiches, food, beverages, coffee, books, electronics, campus gear, or clothing. The deals can also be displayed within the event photo website. Website Development: Students with engineering majors can be trained in website development or IT services to help local businesses build new websites or implement new software. This could be a small version of the Geek Squad using students to help the customers. External Programs: Paid programs where 575 College will build a program to market and sell specific products for the company. The company will receive product promotions, sales, and direct access to student talent. The program can be viewed as a marketing expense for the companies. Examples - web hosting, VOIP, online software, wireless internet, SEO services, and products targeted towards students. Below is a list of example companies that we would like to work with to develop programs. We will develop paid partner programs to fund the initial development and growth of the business. An example program could be built around a VOIP provider. 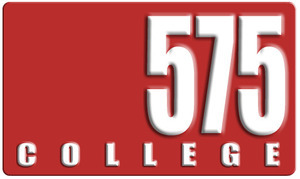 575 College will train students in roles for sales/marketing, and setup/implementation. The VOIP company will pay to develop the program on a per campus basis. The sales/marketing students will market the VOIP services to local businesses around the campus. Then the setup/implementation students will work with the customer to configure the network, setup the extensions, and configure the full system based on customer requirements. Our goal with this competition is to present at the Splash event and talk with other companies that may be interested in using 575 College to build a program around their products. The program would start out as a small trial at a specific campus with the goal of growing the program beyond the trial campus. The 575 College programs will be targeted to incoming college freshmen, current college students, and recent graduates. Our goal is to provide a means for students generate tangible work experience and technology training to help prepare them to enter the working world. 575 College programs will encompass the following core principles. Projects: Produce direct access to work on projects within a variety of different disciplines. Projects provide hands-on experience with clients, training for different roles, and ability to test different fields before deciding a specific direction to focus. Entrepreneurship: Teach project initiative, business management, and how to build and grow a company. Students will eventually have the environment to build elements of their own business within 575 College and use 575 College resources to grow their business. Job Development: Innovate how students develop themselves for entering the working world. It will no longer be a passive process of replying to job postings and hoping for a reply. Students will be working directly with companies and generate career opportunities. Skills Progression: 575 College can work with students to create a logical progression of skills training that will help create relevant experience for their desired career path. Example: A student could start as an event photographer, then transition to photo booth, then to event sales, then to advertising sales, then to project management for their campus. Tangible Results: Relevant work information and metrics for students to build resume and show a potential employer exactly what they have worked on within 575 College. Technology consultant, web developer, late-night hacker, and addicted to developing new ideas, projects, and companies. Specialize in production of live theater and video. Worked in entertainment industry for over 30 years. I have been investing in early and late stage companies since 2004 and am always looking for the newest trend. The business model is to build a nationwide network of college students at different campuses that are trained in a variety of disciplines. The students will be trained through programs developed around current 575 Productions services and products. We will also develop programs around products provided by outside companies. Each program will have income generating components for the students and the company providing the product or service. 575 Productions has existing relationships with college students, student organizations and campuses. These relationships will be used to recruit students and build programs. We have existing technology systems that will be integrated at a basic level to power the training portals and revenue generating components for each program.